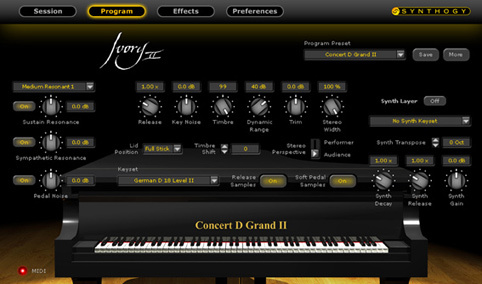 Ivory II, Virtual Acoustic Piano from Synthogy. 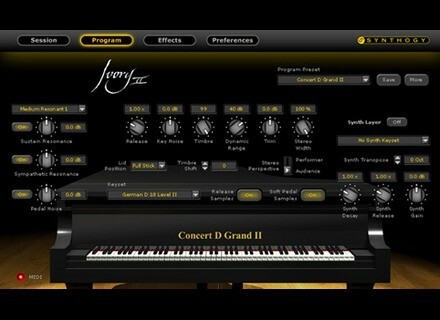 Synthogy has updated Ivory II to version 2.0.3. Improvements to Tuning Table control, Sympathetic Resonance tuning, Silent Key threshold. PropellerHead Reason 6 & Reason Essentials Propellerhead Software announced Reason 6, a major update. At the same time Propellerhead debuts Reason Essentials, the successor to Record, that comes with recording, editing, effects, instruments, mixing and mastering features in one package. EdgeSounds Electric Piano Sound EdgeSounds has announced the release of the Electric Piano, a 2-DVD-ROM sound sample library for NI Kontakt and Giga Studio. BeepStreet Sunrizer v1.1 BeepStreet has released version 1.1 of Sunrizer synth (formerly known as Horizon), its VA synth for iPad.